Chris Avalos bounced back from his unsuccessful attempt at a world title earlier this year and scored a dominant Unanimous Decision (UD) victory against a game Rey Perez in a scheduled eight-rounder at the Dr. Pepper Arena in Frisco, Texas. 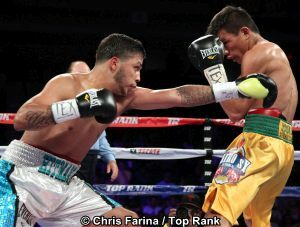 Avalos who despite being a late sub for the injured Jessie Magdaleno, overshadowed Perez with accuracy and aggressiveness in a headlining bout shown on Unimas, a Spanish Network in the United States. The American who won with ringside scores of 80-72, 80-72 and 79–73, dictated the pace of the entire fight, walking down Perez with shots to the body and head which the Filipino has no answer or defense for. Perez wanted to counter but his punches are not getting through Avalos’ defense and movement. The Filipino fighter targeted his opponent’s midsection from the start of the fight, hoping that will slow down Avalos who took the fight on late notice. That plan did not work against Avalos who lost via TKO in Ireland in February against IBF Super Bantamweight champion, Carl Frampton. He pursued Perez all night and landing short hooks in the head in the process. Perez took Avalos’ shots well and even launched a last minute assault in the final round. He staggered Avalos with two straight rights in the early goings of the round and again in the closing moments of the 8th. But that was not enough to salvage a win as Avalos remained upright and even remained as the aggressor in the round. Avalos improved to 26-3 (19 KOs) while Perez dropped to 20-7 (5 KOs).